The app economy is here, and it has changed the way that we live. We depend on our smartphone apps for everything from entertainment to photography to messaging to personal productivity to ordering transport or accommodation. And in South Africa, we’re becoming increasingly open to using our smartphones for in-app, in-store and online payments. This is the culmination of the long relationship of trust we have developed with our mobile devices – we trust our device manufacturers and the developers of our favourite apps to keep our data secure and private. If we can trust our smartphones to keep pics of our children and our personal and business emails safe, we feel we can trust them as a payments environment. According to the Mastercard Impact of Innovation Study, 73% of South African consumers are ready to pay with their mobile phones. That’s why we are seeing the rise of innovative payments apps that enable you to use QR codes or contactless technology to make payments – whether you’re paying a municipal bill, buying prepaid airtime or purchasing a cappuccino in your favourite coffee shop. Access to capital and size are no longer constraints for merchants who want to accept digital payments. The natural endpoint is that we’ll see much of today’s large-scale physical payment infrastructure move onto smartphone apps and easy to deploy QR codes, giving merchants and consumers a simple, seamless, on-demand payments experience. 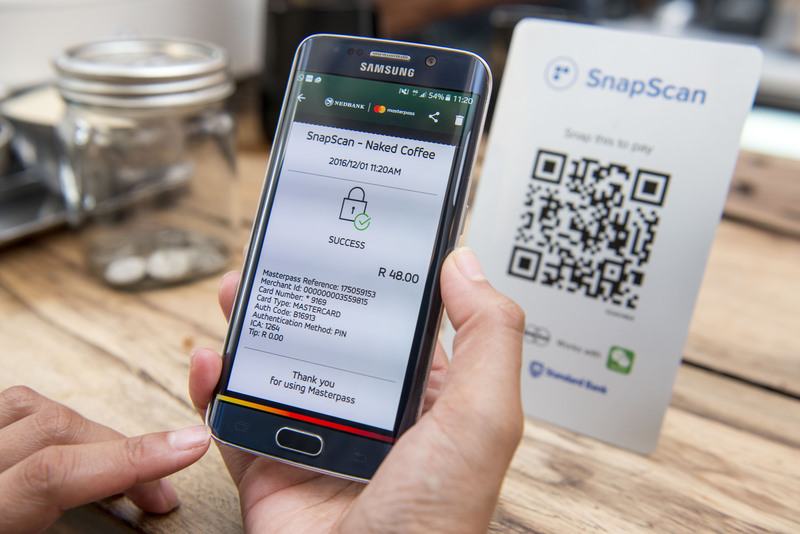 For example, SnapScan, a mobile payments solution backed by Standard Bank, makes it affordable and easy for merchants to accept digital card payments, with merchants simply needing to display a QR code at the till, online or on a bill. This means that entrepreneurs can go down to the farmers market on a Saturday and start selling their goods using a QR code. They don’t need to worry about having to manage cash, or getting robbed, and can increase sales by giving their customers the choice and flexibility to pay with their cards in their mobile wallets. As we think about the rapid adoption of mobile payments, we believe the promise of mobile payment services lies in creating safer and richer experiences for consumers. But, the key is not to simply recreate what you could do before, but to enable users to do something new and better. We know consumers don’t set out to ‘make a payment’. They’re just going about their everyday lives and are looking for better experiences, shortcuts. They want paying for things to be simpler and faster. That’s why connecting with consumers wherever they are and whenever they want is critical. Imagine, for example, a world where people don’t need to queue for hours to send money to their families in the rural areas or where no one needs to withdraw cash from an ATM and then stand in a long queue at a retailer on a Saturday to pay a rates bill. They don’t even need to log in to online banking and input a lot of payment t information. Instead, they’ll be able to scan a QR code on the statement and pay from an app. And at a Quick Service Restaurant, rather than queuing in a takeaway store to place an order, they could order and pay from their smartphone as they enter the doors. This is a world where merchants don’t need to keep large amounts of cash on their premises. It’s one where consumers demand convenience and control, and expect payment experiences to make their lives better. We are not talking about a distant future, either. In South Africa, more than 900,000 ratepayers in the City of Ekurhuleni can now pay their municipal bills online with their smartphones, using Masterpass, our global digital payment service. Masterpass is also accepted online by a growing list of merchants of all sizes as well as in-app for convenient air and data mobile top up. Mastercard’s recent collaboration with SnapScan also gives consumers more than 30,000 locations like coffee shops and markets to pay for goods and services using Masterpass app on their smartphones. As simple as the consumer experience is, there is a lot of complexity in the background as technology companies like Mastercard, telecoms operators, issuers, retailers, regulators, FinTech innovators and the other members of the value chain work together to ensure that digital payments systems are secure and interoperable. Without collaboration across industry boundaries, it will not be possible to deliver the experiences consumers demand or achieve the momentum required to scale mobile payments. We at Mastercard are expanding our relationship with these partners to innovate not only in the traditional spaces of card payments but to pioneer the next generation of digital innovations to ensure that every one of our accounts is as digital as the people using them. We are collaborating with key players to form partnerships that will assist in developing and delivering new consumer propositions that span multiple industries across multiple channels – in-store, in-app and online. And in doing so, we’re bringing to safer and richer payment experiences to enable consumers to make every day payments using the device they already have in their pockets – their mobile phone. Mastercard (NSYE: MA), www.mastercard.com is a technology company in the global payments industry. We operate the world’s fastest payments processing network, connecting consumers, financial institutions, merchants, governments and businesses in more than 210 countries and territories. Mastercard products and solutions make everyday commerce activities – such as shopping, traveling, running a business and managing finances – easier, more secure and more efficient for everyone. Follow us on Twitter: @MastercardMEA and @MastercardNews join the discussion on the Beyond the Transaction Blog and subscribe for the latest news on the MEA Engagement Bureau.